Do Not Use With Retin-A or Accutane. For Nighttime Use Only. DISCOLORATIONS, AGE SPOTS, BLEMISHES. This Retinol formula is encapsulated in a delivery system that provides maximum release with reduced irritation typically associated with retinoid use. Retinol diminishes the appearance of fine lines and deep wrinkles by stimulating collagen production. Clinical studies show reduction of deep wrinkles by 44% and lifting effect increase by 16% with the ingredientPalmitoyl Pentapeptide 4 . 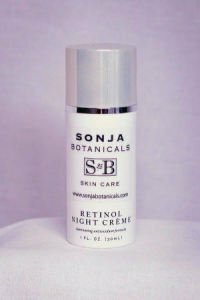 Additionally, Retinol stimulates cell regeneration to enhance skin tone and texture and reduce the appearance of age spots and occasional blemishes. Daisy Extract which shows a reduction of melanin formation and significant lightening effect, and Vitamins C, E, and A are added to help protect from free radical damage.